OSWEGO, NY – The Oswego Farmersâ€™ Market continues July 29. Central New York band Mojo will provide entertainment for the night. Mojo will provide the musical entertainment as the Oswego Farmersâ€™ Market on July 29. 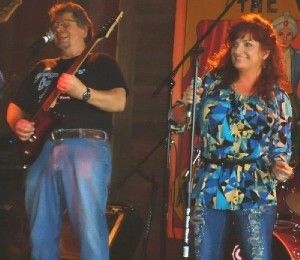 Pictured are guitarist Mark Hoffmann and vocalist Miss Lisa. Comprised of five talented and experienced musicians, Mojo features the sultry, soulful sounds of vocalist Miss Lisa and the guitar work of Syracuse Area Music Awards Hall of Fame member Mark Hoffmann. Located on West First Street, between Bridge and Oneida streets, the market offers a great selection of fresh produce plus a variety of homemade baked goods, delicacies and plenty of arts and crafts along with other crowd favorites. Electronic transactions such as credit, debit or food stamp cards can be accommodated at the chamberâ€™s market booth as customers may purchase tokens that function as cash within the market. The market is held Thursdays from 4 â€“ 8 p.m. through Sept. 30.